You will be given a reference e-book to read which has 167 pages And the test will be based on that e-book , you can take final test within 1 year of purchase. AWS which stands for Amazon Web Services refers to a service which offers a full set of application services and infrastructure that improves your ability to operate everything virtually in the cloud. You can operate huge data projects, mobile apps, social games and enterprise applications through this. It is also defined by a lot of experts as a set which contains remote computing services that are being combined together as a means of building an effective cloud computing platform. These services are mainly offered over the web. Among the most popular Amazon web services at present are the Amazon S3 and the Amazon EC2. Introduced to the public in 2002, Amazon Web Services can also be expected to work in providing the most effective online services for client-side applications and various websites. It should be noted that the offered services are not directly exposed to their end users. As a matter of fact, these work in improving the kind of functionality needed by different developers when creating or using their applications. All offered Amazon Web Services can be easily accessed through SOAP and REST protocols over HTTP. The billing process is mainly dependent upon usage but you should remember that the process of measuring this usage for the purpose of billing differs from one service to another. 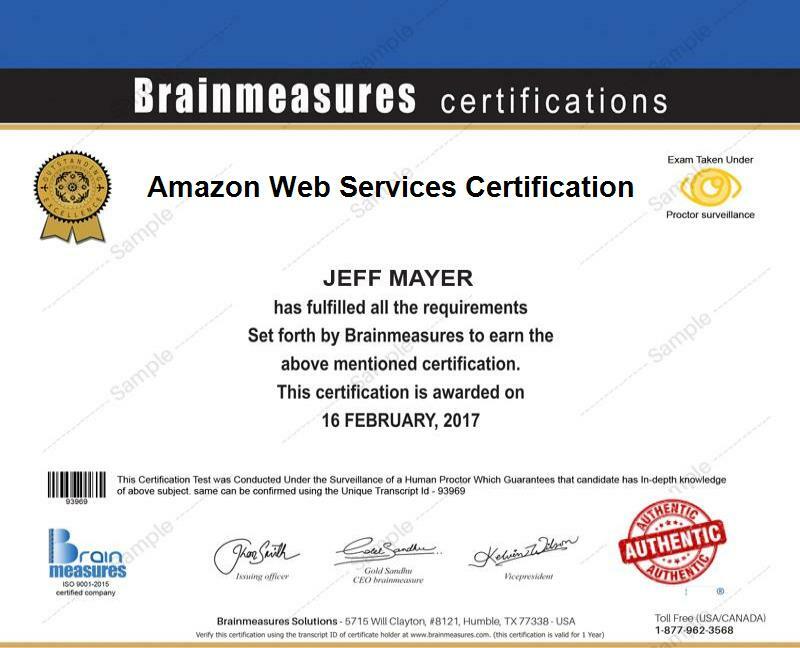 Deciding to take part in the Amazon Web Services certification program which you can now conveniently access at Brainmeasures is a wise move considering the fact that this online certification course entitles you to receive the most relevant information about AWS. Every essential topic linked to AWS is included in this Amazon Web Services course so you will definitely enjoy your experience upon enrolling in it. This online certification course can offer you with a detailed Amazon web services training which can help you in strengthening your background about AWS, the scope of its services, the individual benefits provided by each service, the most popular and useful AWS products and the basics of making the most out of each Amazon web service. Earning an Amazon Web Services certificate is one of the many decisions that you will definitely take pride of since it shows your high level of proficiency in this field. How to find the best scalable hosting service which acts similarly to Amazon EC2? How to easily store vital information with the help of Amazon EC2? How to acquire quotes designed for virtualization services and managed data centres? The Amazon Web Services certification program offered by Brainmeasures is flexible enough that you can expect it to become an ideal course for different individuals and professionals. This online certification program can offer numerous benefits to practicing and aspiring Cloud strategists, data centre and operations managers, administrators, IT developers and architects, application and security managers and statisticians. Annual salary received by Amazon Web Services certification holders is also said to be higher. If you are an Amazon Web Services certification holder, then expect to easily work as an Amazon Web Services support engineer and you can expect this profession to supply you with an average annual salary of $63,000. Working as an Amazon Web Services solutions architect is also possible and you can earn up to $118,000 annually from this.